Most Advanced ​Cochlear Implantation Treatment at World Class Hospitals in India – Affordable Cost Assured. Benefit from our Expertise – We have assisted hundreds of Patients to find Affordable Treatment at World Class Hospitals in India. My child was discovered as hearing deficient just after she was born. 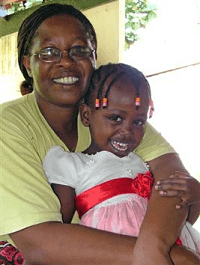 We consulted the best doctors in our home country and they were of the opinion that Cochlear Implant surgery was required and it was not available in Kenya. Then I started to search for hospitals outside my country for the treatment. The hospitals in America charged a huge amount for the treatment which was beyond my reach. Then one of my friends told me about India. I searched on the internet and I found SafeMedTrip website. I filled up the form on the website. I got a call from the case manager and she told me to send the medical reports. I sent the reports by mail and the case manager got back to me with the opinion doctor and the treatment package. The case manager helped me with the passport, visa and the air tickets which saved a lot of my time. On the day we arrived in India, we met the surgeon and all our admission formalities were done. I have never seen such caring services in hospitals back home in my country. The next day and a series of tests were carried out and the surgery was planned and was successful. Over come deafness and get the joy of hearing – More than 2,00,000 people worldwide have benefitted from this highly advanced latest technology. A cochlear implant (CI) is a surgically implanted electronic device that provides a sense of sound to a person who is profoundly deaf or severely hard of hearing or has not received any benefit from hearing aids. The cochlear implant is often referred to as a bionic ear. External (outside) parts that include a microphone, a speech processor, and a transmitter. 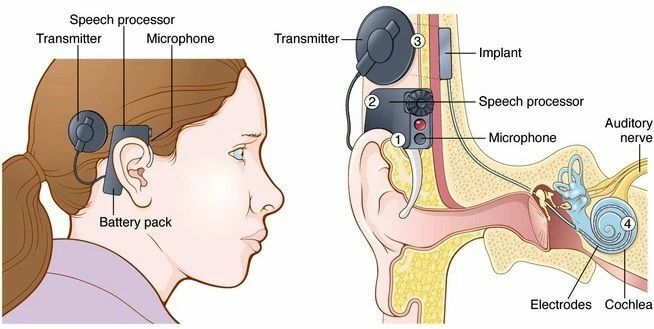 Internal (surgically implanted) parts – a receiver-stimulating system fixed to the skull bone behind the ear and electrodes which are inserted into the cochlea. There are various factors that need to be taken into consideration prior to cochlear implantation. 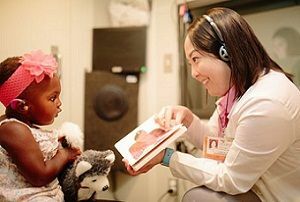 Patients who may be candidates for cochlear implantation would have met with their audiologist and ENT(Hearing implant) Surgeon and the team would decide the best option for the candidate. 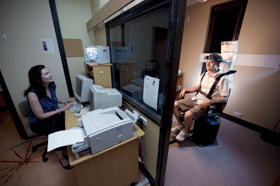 Audiological assessment and trial with hearing aids. To assess the severity of the hearing loss, level of speech and language. CT and MRI Imaging – Complete scanning would be done of the ears and brain. We need to see the structure of the ears and the condition of the inner ear and hearing nerves. Medical Check up including preoperative blood tests. Patients would also be seen by a physician or paediatrician (in the cases of children) and vaccinated to reduce the risk of infections. 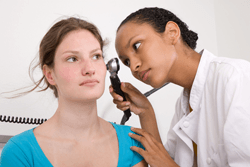 Who ​can benefit from Cochlear Implantation ? Children who have acquired some speech then lose the sense of hearing following head injury, viral illness or meningitis etc. 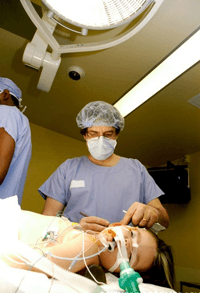 Cochlear implant surgery lasts about two hours and is performed while the patient is under general anaesthesia. The electrode array is inserted into the cochlea. The receiver/stimulator is secured to the skull. Typically, patients remain in the hospital for two nights. They have a bandage on their head which is removed after four days. Patients return to school or work as soon as they feel well enough to do so, usually within a week of surgery.